As faux Washingtonians, we are absolutely thrilled that the National Cherry Blossom Festival is right around the corner! This year, the peak bloom time will be March 15th and we cannot wait. It is a reminder not only that Spring is right around the corner but that international relations between Japan and the United States are still thriving. Today, we're going to explore the history behind the Cherry Blossoms in D.C and the celebrations that surround their presence. 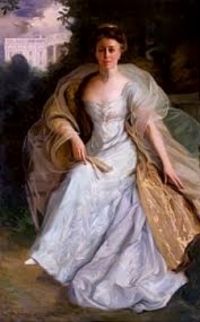 Helen Taft in her official White House Portrait. The Cherry Blossom Festival commemorates the 1912 gift of 3,000 cherry trees from Japan to the United States to show lasting friendship between the two countries. The first two trees were planted by First Lady Helen Herron Taft and wife of the Japanese ambassador, Viscountess Chinda on the north bank of the Tidal Basin on West Potomac Park. The Cherry Blossom trees are commonly grouped together however, there were originally 12 varietals in the 3,000 original trees. The only existing trees are Yoshino and Kwanzan. Yoshiko are white blossoms and appear two weeks earlier than Kwanzan. Kwanzan are what we typically think of when we say "Cherry Blossoms" and and produce clear pink double blossoms. The First "Cherry Blossom Festival" happened in 1934 and was started by numerous civic groups. By this point, the blooming of cherry blossoms had become an integral part of Washington, DC life and it marked a great time to kick-off spring and summer charities, fundraisers, and events. However, in the 1940's events halted with the attack on Pearl Harbor and strained relations. in 1947, the events started back up with approval from the Washington, D.C. Board of Trade and the D.C. Commissioners. In 1965, an additional 3,800 Yoshiko trees were gifted to Lady Bird Johnson and were planted near the Washington Monument. They reenacted the 1912 planting with the addition of Ryuji Takeuchi, the Japanese ambassador's wife. Lady Bird Johnson in 1965. One fun fact is you can even get married under the Cherry Blossom Trees! You need to contact the parks department to plan this, but if you're looking for a different idea in one of the most beautiful settings, this may be just the idea you were searching for. Today, the festival lasts four weeks and brings an annual 1.5 million visitors to the Greater Washington D.C. region. The list of events can be overwhelming! However, the festival's website makes it easy to navigate and purchase tickets. Go outside, take pictures, and cherish the impressive albeit short time you can enjoy these national treasures!